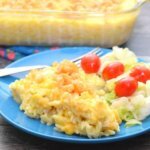 This Leftover Turkey Casserole is so easy to put together, and it takes just 20 minutes to bake. Your family will love this comfort food for a simple weeknight meal. Boil 4 cups of water in a dutch oven. Add the orzo pasta and let it boil on high for 4-5 minutes. Then, turn off fire and cover with the lid. Let it sit for about 10 minutes, until most the water is soaked into the pasta. If the orzo pasta is still watery after 10 minutes, drain it. If the water is mostly soaked up, then skip this step. Add the cream of chicken soup and cheese to the pasta and mix. Using the empty cans, fill one with water and one with half and half and add to the pasta mixture. Add the turkey and mix up until completely combined. Transfer the turkey casserole mixture to the pan. Combine the butter and Ritz crackers. Spread the cracker mixture over the top of the casserole.